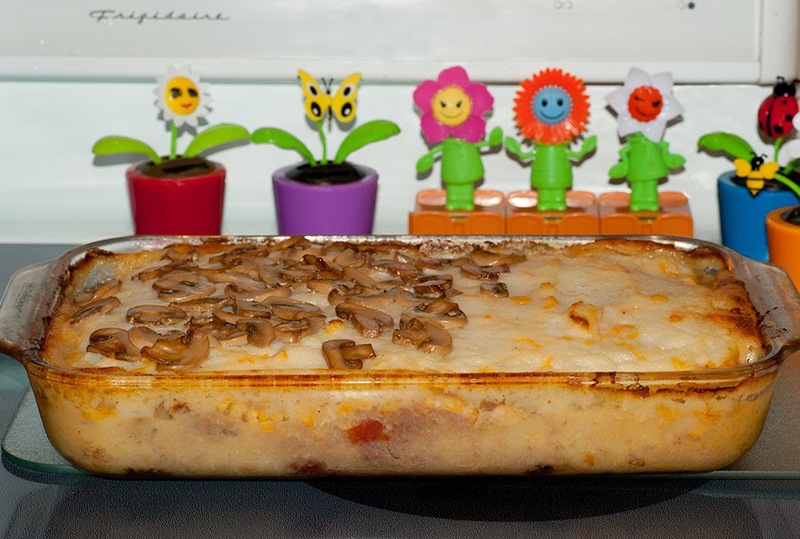 At Home with Gracey: Shepherd's Pie - An Italian Twist! 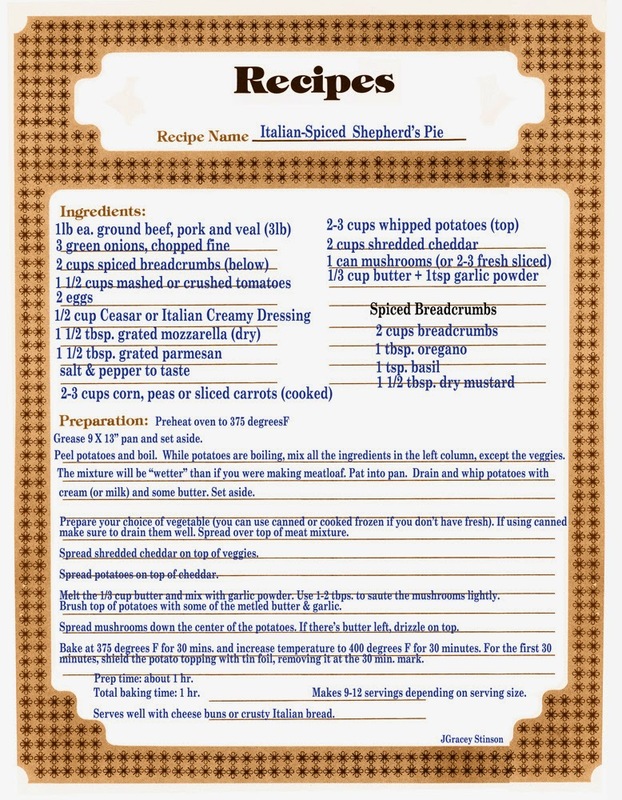 Shepherd's Pie - An Italian Twist! 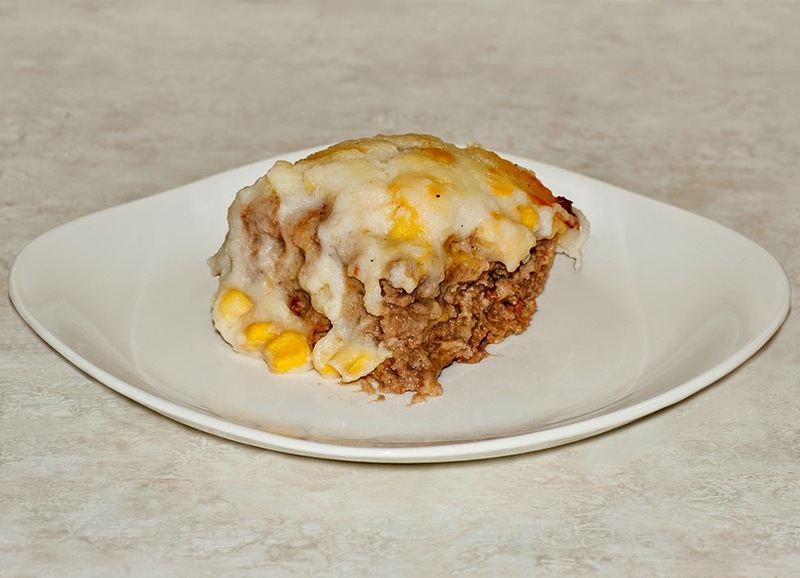 Shepherd's pie has been a traditional dish for hundreds of years (originally known as Cottage Pie), and has pretty much always been a dish that used left over meats. My mom used to use our leftover meat for her Shepherd's Pie too, although the one meat it never really contained was lamb (and lamb was often a component in early Scottish Shepherd's Pie). My mom would take any leftover meat from a meal and put it into a large plastic zip-bag in the freezer. She'd add to that bag until it was full, when she'd take it out, pull down the old hand grinder from the top of the kitchen cupboard and grind up all the leftover's together. It didn't matter what meat it was, it all went into her Shepherd's Pie. She would put gravy and spices into her meat - since it was already cooked, without the gravy the pie would have been very dry otherwise. In the end, I suppose "pie" is a bit of a misnomer since it's not really a "meat pie", but it is a one-dish meal. Today, most of us use fresh ground meats to make this dish, but you still can (if you prefer) use leftover meats. This particular recipe is a bit of a take-off on my mom's. 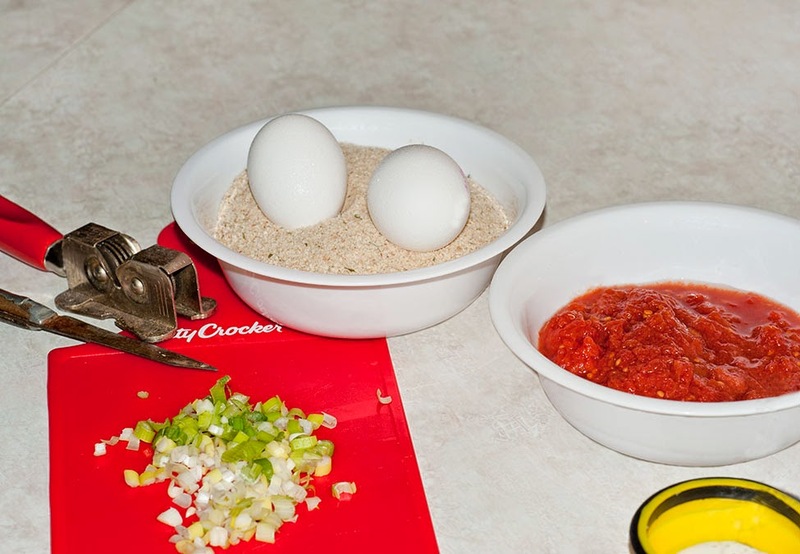 I'm not as much of an experimental cook as she was, mostly I use our family recipes when I cook - what my mom did, or what my grandmother did, so for me, this recipe was a bit of an experiment; one that the guys loved, so I thought I'd share. You can adjust the meat types in the recipe - either use leftovers or purchase the types of meat you prefer. You can substitute the vegetables as well - instead of peas, carrots, or corn, try sliced-cooked zucchini! Because this is a fairly large dish when compiled, it might be a good recipe if you prepare meals for shut-ins, or the elderly (for things like Meals on Wheels). I make this in one large pan, but you can buy small individual sized foil pans with cardboard lids. Once the ingredients are prepared, instead of putting it into one dish to bake, separate the ingredients equally into individual foil dishes for baking (you will probably need to adjust the baking time since they are smaller portions). Once baked, cover with the cardboard or plastic lid and freeze ... or deliver to the less fortunate. You can make this ahead and bake in two smaller sized pans to freeze for your own family as well. So, grab the printable recipe at the top and get started. Begin with the potato if you are using fresh ones. Pretty much everyone knows how to make mashed potatoes, but for this dish if you have it, use cream (5 or 10% fat), but you can substitute the cream with milk if you'd rather, and butter (best not to substitute margarine for butter), and use an electric beater to whip them up light and fluffy. They need to be a little looser than a mashed potato you'd put on a plate - remember, it still has to be baked for an hour. 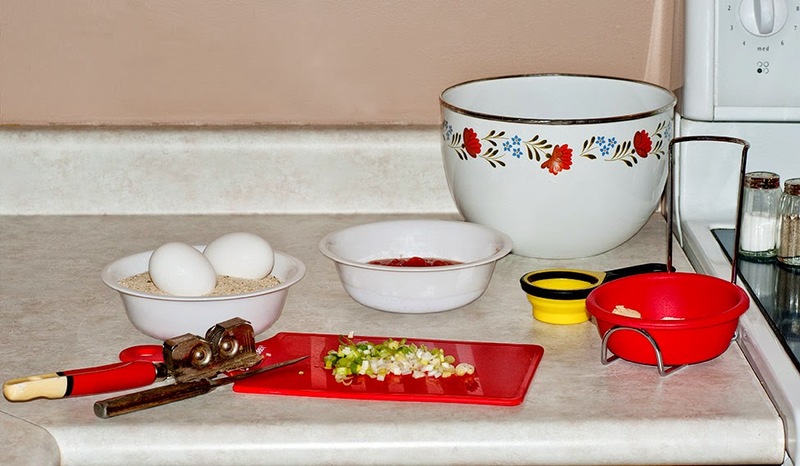 I usually get all my ingredients pre-prepared and set into dishes, making it easier to compile the dish. Measure out the spices and other additions into dishes. Mash the tomatoes to the consistency of chunky sauce (or you can use canned crushed tomatoes). Prepare and cook the veggies (unless you're using tinned ones). Slice the mushrooms and set them aside. 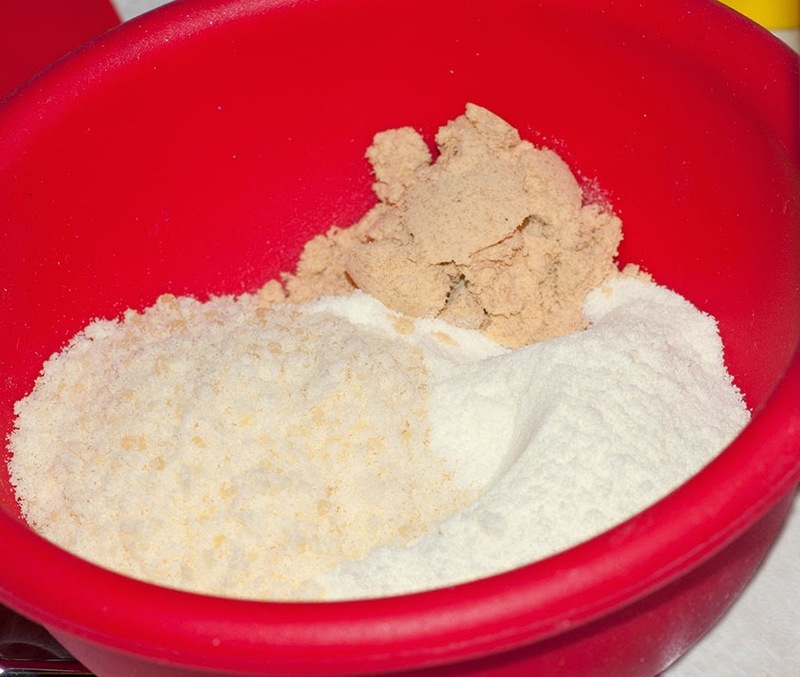 Mix the spiced bread crumbs (bread crumbs and spices) in a bowl (by the way - this bread crumb mix can be used for other foods, like breaded chicken, fish, smelts, sliced fried tomato and zucchini - oh, that's another recipe of my mom's). Once the small prep work is done, you can start putting it all together - mix the ground meats, add the ingredients listed to the meat and smooth into the pan. Top with your veggie, then the cheese. Spread the potato mix on top, saute the mushrooms and spread on top, add the butter and bake following the instructions. Um, just so you know - I don't like mushrooms, so instead of spreading them right down the middle of the topping, I spread them around one end, leaving part of it free of mushrooms for myself. It looks nicer (for serving) when you spread them straight down the middle but, eh, I had to eat too. Serve with caesar or italian salad, a hot crusty bread or buns and you're ready to roll. And ... my dinner is served (yep, that's mine before I ate it.) And no, it's not particularly health-conscious, nor low calorie, but it is "real food" definitely yummy!